Shown left is the Murphy A34. This receiver also features the alphabetical drum tuning system. The cabinet is also rather less severe than some of the designs seen in previous years, and perhaps more agreeable to the eye. Some interest is added by the four slim dark vertical lines that rise up from the front of the cabinet and over the top to the back, three of the four along the way passing behind the tone, volume and wavechange knobs. The fourth line keeps the pattern symmetrical on the cabinet. The circuit is fairly basic, but does incorporate a magic eye. 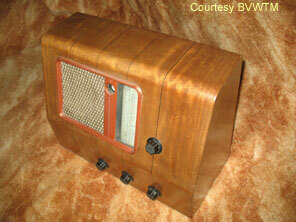 There was no console version of this radio available, only a radiogram version. Potential purchasers seeking a moderately priced console in 1937 would have been directed to the A38C, although it was more than 50% more expensive than the A34 table model. 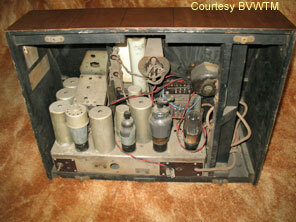 The A38C was only available in console form, not table top or radiogram. Valve line-up is AC/TP, AC/VP2, AC/ME, AC2/PENDD, UU4.